You have tough questions about money - Nancy LaPointe has answers. 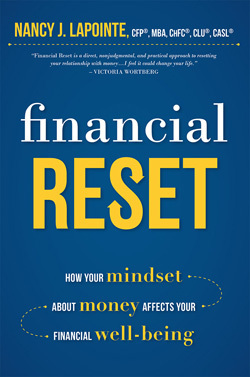 Financial Reset is a steadfast reference to consult in times of financial insecurity that will transform haphazard decisions into workable, calculated strategies. Hit the "reset" button and start fresh with the right attitude to develop habits that support your values and intentions. A ship without a rudder can certainly make its way across the water, but it has no control of where the water will take it - so grab your rudder and take initiative of your financial destiny. "Just wanted to tell you I am enjoying your book! You write in a strong voice that gives the reader confidence that they can do a lot to strengthen their financial wellbeing.